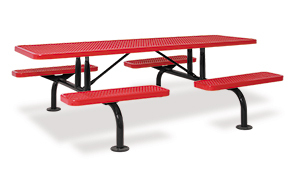 Provide generous seating for eight adults with this heavy duty and spacious 8' steel rectangular span leg outdoor table. Elegantly styled, this steel diamond pattern and open design of this expanded steel table creates comfortable and convenient experience. The unique seats are user friendly, allowing simple entry and exit of the table. This highly stable and versatile table is constructed with a MIG welded, 2-3/8" steel tube frame that connects the expanded steel table top and 4 bench seats. In-ground and surface mount models are available.